All across Europe feed-in tariffs and subsidies for solar power are being cut or even scraped. In Portugal and Spain these actions are justified with the debt crisis, even though they expand these states' trade deficit. This month the Spanish government took a decisive move to scare investors away and expel most renewable energies from the electric gird, particularly Solar. (Reuters) - Foreign investors in renewable energy projects in Spain have hired lawyers to prepare potential international legal action against the Spanish government over new rules they say break their contracts. Diving into the numbers what one finds behind this policy U-turn is something entirely different. Update III: Follow up research on this topic has been published in the peer reviewed article Photovoltaics: new policy challenges for Europe. Update II: The Solar Power Cost Calculator is an open source web application that implements the mathematical formulas used in this post. Update I: If you intend to comment please read this note first. En se basant sur une analyse de ses services, le ministre de l'Economie, Etienne Schneider fait un constat sans appel. Constat qui touche surtout la filière photovoltaïque, "qui coûte très cher pour un bilan en matière de développement des énergies renouvelables très faible". Supported by the analysis of his services, the Economy minister, Etienne Schneider, had a rotund remark. An observation that touches above all the photo-voltaic sector, "that is too expensive for a weak result in terms of renewable energies development". «Par comparaison, 1 megawatt/heure [sic] (mW/h) [sic] produit grâce à l'éolien coûte 14 fois moins cher qu'1 mW/h [sic] issu du photovoltaïque, précise le ministre. «In comparison, 1 megawatt/heure [sic] (mW/h) [sic] produced by wind is 14 times cheaper than 1 mW/h [sic] produced by photo-voltaics, details the minister. Donc pour la même quantité d'énergie renouvelable, nous payons 14 fois plus pour le solaire. Toutes les autres formes sont aussi moins chères.» Hence for the same quantity of renewable energy, we pay 14 times over for solar. All the other forms [of energy] are also cheaper." And thus the Luxembourger economy minister totally erased feed-in tariffs on photo-voltaics (PV) installations above 30 kWp and sharply reduced those on installation under 30 kWp. Apart from the journalistic creativity with the mili-Watts per hour, is solar power really that expensive? This post provides an answer to this question, showing that the real reason behind this detraction of solar energy is pretty much the opposite of what is claimed by minister Schneider. and installation, that includes, labour, paperwork and whatever else needed to get the system up and running. Panel size or capacity is described with the maximum amount of power they can harvest at optimal sunshine conditions; this is measured in Watts-peak (Wp). Panel prices are quoted in €/Wp and since both the inverter and installation costs scale closely with panel capacity, companies can provide a price for the ensemble on a convenient €/Wp basis. There is an ecological fair every year in Luxembourg city by October, better known by the Luxembourgish term: Oekofoire. I was there last year and took my time at the PV companies booths that usually litter the place. Back then the price asked by these companies for a solar system was at 1.6 €/Wp. This price comprised 0.6 €/Wp for the panels, 0.2 €/Wp for the inverter and the remainder 0.8 €/Wp for installation. The fact that the basic hardware is now only half the price of a PV system already indicates that reality may not be exactly matching the political discourse. By December I got the information that in Germany these price were already down to 1.3 €/Wp, in places with good access and ease of installation. This reflects the relentless price decline of both solar cells and inverters, the former declining by 40% in 2012 alone. 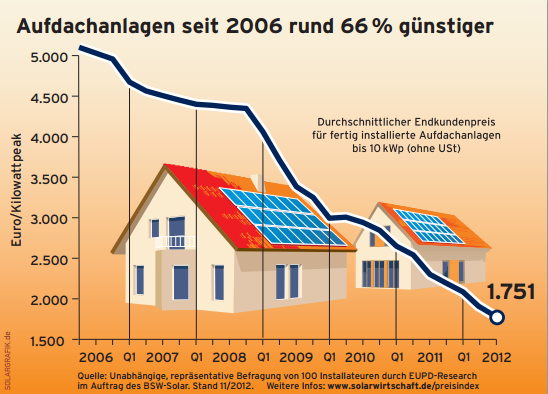 Figure 1 - PV system prices (installation plus hardware) in Germany from January of 2006 to June of 2012, showing a linear decline of 500 €/kWp/year. Source: Solarwirtschaft.de. In recent years the solar market has underwent the transformation imposed by what is usually termed economies of scale. From small factories in Europe, the production of solar PV cells migrated to huge factories in Asia. And with this transformation came the usual cycles in large markets where product differentiation isn't obvious. By the midst of 2012 some Asian producers where reportedly selling cells about 0.2 €/Wp below cost, in a clear supply destruction cycle. This has created a row in Europe, with local producers calling for taxes on Asian products and investors claiming that this is the way for affordable electricity. Even if this supply destruction cycle is indeed the driver of recent price drops, a return to prices of two, or even one year ago, is not to expect. In first place because the solar market is showing a clear resemblance with the computer hardware market, with similar breathtaking price declines. In both cases the final product is pure technology, which can only improve with time, like the number of transistor per unit of area. The efficiency of PV technology keeps increasing, and improvements like auto-cooling are still yet to reach the market. And secondly because production is not going back to Europe, if its not economical to produce a smartphone or a laptop in Europe, much less it is with a simpler technology like a solar cell. Table 1 - Parameters and corresponding values used to build Scenario I - basic costs. The only figure here not referred before is the general maintenance. The PV system I installed in Portugal is now almost 3 years old and so far maintenance costs are 0 €; the thing just sits there and produces electricity. I know I'll have to replace the inverter at some point, since the warranty is only valid for 10 years, apart from that, other maintenance interventions are hard to foresee at this stage. Finally coming to the price the graph below presents solar power prices as function of system lifetime (Lp) for the figures in Table I in three hypothetical locations: southern Germany (1000 Wh/Wp/a), southern France (1250 Wh/Wp/a) and southern Portugal (1500 Wh/Wp/a). Figure 2 - Prices of solar power as function of system lifetime for three reference locations according to Scenario I. Figure 3 - Share of each cost component in Scenario I. The cost as function of lifetime graph is now reproduced with financing costs, assuming that 80% of the upfront investment is financed for a period of 8 years at an interest rate of 2%; all other parameters are kept from Scenario I. In Luxembourg PV financing can fetch interest rates as low as 1.2%, but I prefer a figure perhaps more representative of the wider European market. Table 2 - Parameters and values for Financing, comprising Scenario II. Figure 4 - Prices of solar power as function of system lifetime for three reference locations according to Scenario II. Figure 5 - Share of each cost component in Scenario II. These figures may seem surprisingly low, but they present an accurate picture of the present PV market, at least at the household scale. On an industrial scale, a few months ago a group of investors appeared in Spain offering electricity to the grid at a fixed price of 0.06 €/kWh, dispensing any subsidies or feed-in tariffs. Los grupos inversores son asiáticos y centroeuropeos, y estarían dispuestos a instalar las centrales fotovoltaicas con unos precios energéticos de pull o subasta de mercado de 6 céntimos de euro el kilovatio, sin prima alguna por la energía renovable instalada. These investment groups are Asian and central-European, and could be ready to install these photo-voltaics plants with energy supply prices of 6 euro cents to the market, without any aid to the installation of renewable energy. If solar power prices are now at these levels, why are governments across Europe apparently thwarting the growth of PV connected to the grid? The answer roots back to the deregulation and privatisation strategies took about a decade ago. At the same time governments where setting up feed-in tariffs and subsidies to renewable energies in the late 1990s and early 2000s, they were also implementing a new electricity market paradigm, dismantling the monopolistic state owned companies, unbundling energy production from grid management and generally privatising the sector. This created a new market where multiple companies trade electricity in the short (spot market) and long term (futures market), supposedly all in the best interest of consumers. Things went well at first, up to the point renewables reached a critical size and simply killed this venerated electricity market. To understand why one must comprehend two essential concepts of economics about renewable energy. In first place comes the reality that renewable technologies like wind, solar, tidal or geothermal dispense any sort of fuel to produce electricity. A gas or diesel fired power plant has a cost every time it produces power, the operator is permanently on the market for the fuel, managing prices that can be rather volatile. Besides this, there are other costs associated with the staff required to run and maintain the plant. In contrast, a solar panel, or a windmill just sit there; they too have maintenance costs, but these are much smaller and can be predicted fairly accurately at project start. The result is that generating an extra kWh of electricity from a solar panel already in place costs close to zero €/kWh. This is what in Economics is termed the marginal cost (in this case for electricity generation). The second important aspect of these renewable technologies is that they generate electricity, and once it is injected into the grid an electron is equal to any other. Moreover, if I have a PV system in my roof and the sun is shining, I can be sure that any other neighbour, or any other investor in the region with a PV system will also be generating electricity. In Economics, a market where supply agents are unable to differentiate their products from one another are called Perfect Concurrency Markets; cereals agriculture in Europe is the classical class room example. This sort of market has a very important characteristic: long term the price matches marginal costs and supply agents struggle to make a profit (this is one of the reasons why there are subsidies to agriculture). A perfect concurrency market with a marginal cost of zero is something totally outside the standard study and practice in Economics. It is the reason why spot electricity prices collapse during sunny summer days or why during autumn storms there can even be negative prices. These are all symptoms of a market whose price will get closer and closer to zero the larger the number of renewable energy systems connected. German Solar Bringing Down Price of Afternoon Electricity, Big Time! Renewable sources of energy such as solar and wind have been outstripping the electricity supply of traditional baseload (coal, nuclear, and some natural gas) power plants during daytime, especially afternoons, in some renewable-leading countries of late. One reason for this is: electricity demand tends to increase during the sunniest (the hottest) hours, and solar power plants generate more electricity when it is sunnier, which is right on cue. Not perfectly, but solar power production tends to follow electricity demand. This is especially true in the warmer temperatures, since air conditioners (which consume a lot of electricity) are turned up to compensate for the hot afternoon weather. And this is killing the traditional electricity suppliers with business models around fossil fuel energies. They simply cannot make it in such market, that on reflection seems clearly ill conceived. Governments have nothing innate against renewable energies, they are simply trying to protect these important companies, and also the philosophical reverence for the Market. Particularly in Germany, far from the sunniest or windiest place in Europe, the mismatch between a fully liberalised marked and renewable energy growth is creating all sorts of problems. Grid managers are unable or unwilling to upgrade the grid, voltage goes up during sunny days threatening to bring the grid down and even maintenance is an issue. In some Lands it is getting so serious that the government, composed by Conservatives and Liberals, is contemplating the outright nationalisation of the grid. The consumer protection minister, a member of the Christian Social Union (CSU), the Bavarian sister party to Merkel's conservative Christian Democratic Union (CDU), seems to have struck a chord with the call, too. Many experts in business and politics believe that Germany would be better off with a national power grid that is partially or even fully owned by the government -- especially at a time when the German electricity market will have to be completely revamped because of the Energiewende, Berlin's policy of phasing out all nuclear power plants by 2022 and ensuring that 80 percent of the country's electricity supply comes from clean energy by 2050. With these PV prices and in such market setting, governments can only do so much to hamper the growth of solar power. Without feed-in tariffs investors will simply go off grid. The storage values used to build this third and final scenario are summarised in Table 3, that adds to to values in tables 1 and 2. Table 3 - Parameters and values for Storage, comprising Scenario III. Figure 6 - Prices of solar power as functions of system lifetime for three reference locations according to Scenario III. Figure 7 - Share os each cost component in Scenario III. There are two essential drawbacks with the off grid option. Firstly the system has to be scaled back to the in situ summer demand, potentially leaving rooftop space unused. And secondly there is the efficiency loss imposed by storage, it will always be more efficient to feed this electricity to the grid and reach a broader range of consumers. But in essence, with 0.10 €/kWh or 0.12 €/kWh below the grid price, there is a good deal of room to go off grid with some storage scheme and still spare money. There are already today in the market companies that supply such integrated solutions - a few PV panels, batteries and an inverter/controller - claiming prices below the grid benchmark. For households that own an electric vehicle with its own storage pack things get even more straightforward. In fact, this market is so paradoxal, that investors can even think of simply going by without storage, waste the extra electricity generated during summer days and still get a final price below that asked by grid operators. Some analysts are projecting off grid to grow faster than grid connected systems. Electricity for Germany next year lost 65 cents to 43.30 euros ($57.93) a megawatt-hour, it’s biggest decline since March 6, according to broker data compiled by Bloomberg. The French equivalent lost 15 cents to 46.20 euros. As much as 18 percent of electricity demand may be replaced by solar panels not connected to Germany’s grid, reducing demand for other sources by 6 to 10 percent by 2020, Per Lekander, a Paris-based analyst at UBS AG (UBSN), said in a research note. “The unsubsidized solar growth should drive wholesale power prices further down,” he said. But these PV prices also bring opportunities, especially for the industry. Companies that are able to shift their operations to concentrate energy intensive process during the sunnier half of the year can access considerably lower electricity prices, and thus acquire a competitive advantage. This can require a relevant change to the way industrial processes are managed, but with oil at 110 $/b this is a changing world. And here is the drama traditional suppliers will be facing in the foreseeable future. They will either be dealing with declining prices or with declining demand. Either way base load power plants will be running below capacity or even be mothballed during summer and stormy seasons. Reducing or scrapping feed-in tariffs is the proverbial kick in the can; and without them the impact on the electricity market can in time be even worse. Without fundamental changes to the market, the future for fossil fired an nuclear electricity generation is bleak. Governments should be working towards the complete integration of solar systems into the grid, not to their exclusion. In first place they must reckon that only by using schemes like feed-in tariffs can they guarantee the long term permanence of solar producers in the grid. With marginal generation costs close to 0 €/kWh, these systems will never be able to yield proper cash flows in the liberalised electricity market. If the investment on grid connected solar technologies is to continue to come from private investors somehow stable revenues must be guaranteed in the long term. Looking at laws in member states like Luxembourg some advantageous changes become obvious: first of all extend the feed-in tariff to the whole lifetime of the technology and then lower their values. Using the example in Spain, with an expected cost of 0.06 €/kWp for industrial systems, the state can set a 0.10 €/kWp tariff for the first ten years and 0.04 €/kWp for the last decade of production, thus also preserving the important role of break-even anticipation in time that feed-in tariffs perform. With proper feed-in tariffs in place governments can then focus on the monolithic base load electricity suppliers; they won't disappear, but their role will fundamentally change. They must shift their focus from production to storage and load-balancing. Governments can perhaps aid with subsidies on the set up of large and small scale storage infrastructure and most importantly, steering towards the most effective technologies, avoiding pipe dreams like hydrogen. Finally a note on the concept of smart grids. It might be an indispensable step to absorb renewable energies at a large scale, providing real time information on grid voltage, to which prices can be pegged. But care should be taken on its impact, solar and wind technologies will continue having a zero marginal cost on a perfect concurrency market. Smart grids may avoid dreaded episodes of ramping voltage and negative prices, but there's no guarantee they'll create relevant revenues for renewable technologies. The actions recently taken in Europe against solar power are not a sign of failure but rather a consequence of the highly successful progress of PV technologies. Governments are simply trying to defend large electricity suppliers and the electricity markets they created in the last decade. With marginal generation costs close to zero, technologies like solar power wreck havoc on the open market once they reach a critical volume and threaten to steal away revenues from traditional base load suppliers. The actual prices of electricity generated with PV have fallen relentlessly in recent years and are now on par with the gas fired generation at about 40º North in Europe. Even in more northern member states like Germany the cost of solar electricity is now about half of what consumers pay to the grid. At these prices the installation of solar panels can only grow, either on or off grid, unless installation is outlawed. Present strategies by governments to keep these technologies away from the electricity market can at most delay the process. A fundamental shift in the way the grid is managed and prices are set is required, otherwise the electricity generation and distribution complex is left subject to major disruptions, both physical and financial. In great measure the technology required to perform the Energiewende is already here. In fact, the scalability and low prices of PV may mean that this transition is now inevitable. But the growth of solar power clashes with the traditional market structures and concepts of our society in such way that make the end result rather uncertain. The remaining obstacles to the Energiewende are now of a social and economic nature, and these may not be exactly the easiest to overcome. Special thanks to my colleagues Oli O'Naggy and Daniel Koster for the many insightful discussions on this subject. Update: If you intend to comment please read this note first. Deleting my comment? That's not very nice. I can't find any records of your comment. Please repost, all feedback is welcome. Everything I try to post disappears after a page refresh. I lived off the grid for thirty years and now have a 3kWh grid tie system at my new home. At no time was I disconnected from the petroleum supply system. Solar and wind energy capturing devices are not alternative energy sources. They are extensions of the fossil fuel supply system. There is an illusion of looking at the trees and not the forest in the “Renewable” energy world. Not seeing the systems, machineries, fossil fuel uses and environmental degradation that create the devices to capture the sun, wind and biofuels allows myopia and false claims of renewable, clean, green and sustainable. Hello John. I understand your environmental concerns, but I fail to see how any of that changes the issues I discussed in this post. EROEI, environmental impact or dependence on fossil fuels have little to do with the challenges faced presently by grid managers and base load suppliers. In addition to what John mentions, there's a huge difference between "6¢/kWh energy" and "6¢/kWh power on demand". If the renewable generators had to provide the "on demand" part, they'd lose the "6¢/kWh" part. Keeping an AC electrical grid up is a touchier task than most people appreciate. The grid operator's mind isn't on voltage (though voltage matters) as much as frequency. Power flows are driven by phase differences. To keep the grid frequency within its tolerance limits, power generation must be balanced precisely with consumption. If it gets too far off, generators trip and things shut down. This can lead to a blackout. Small RE generators are typically not dispatched or otherwise controlled by the grid operator. Under FIT regimes, grid-tied generators put their full output onto the grid whenever the grid is up. Their output is whatever it is at the moment; they behave as "negative loads". As the size of the negative load increases, the proportional variation of the net load (met by conventional, dispatchable generators) increases without bound. Managing this variation is not something that either existing generators or grid control protocols are designed to do. It's easy to see how an RE-dominated grid could be taken down by its own instabilities. Consider a PV-heavy grid on a sunny day with little load and a pure FIT regime with no grid-operator control. Net conventional generation hits zero and then goes negative, causing the grid frequency to rise beyond control limits. This causes generators to trip offline, and the grid blacks out. As the operator tries to bring the grid back up, connecting segments with too much PV causes generation to exceed the available regulation capacity to equalize demand with supply and it blacks out again. The most likely response would be to wait until the sun had fallen far enough to cut the PV output well below total demand, extending the blackout duration. There are ways to manage things like this, but AFAIK the only one that's been used in practice is running something like pumped hydro to add load. Given the limited geographical possibilities for pumped storage, it's obvious that more is needed for anything remotely close to a renewable electric grid—a LOT more. That's going to cost plenty of money, and if that's not being paid by the producers of "6¢/kWh" PV electricity who are creating the problem, it's being shoved off onto someone who isn't. That's called "market failure", and the existing practice in Germany of pushing the costs onto residential customers is creating a class of "electricity have-nots" who can't afford to pay their bills and wind up disconnected for months at a time. That's not sustainable either. What Germany and Spain really need to do is to get realistic about carbon-free energy, and compensate all sources by both production and dispatchability. That means nuclear, as little as some people want to admit it. I disagree. On sunny days spot prices will consistently vary in the order of 0.06 €/kWh in a matter of hours. This is when storage services can make a profit, without additional charges. The effect of an open spot market on demand is also not to be underestimated. I'm not against nuclear, but the feed-in tariffs suppliers are asking presently in Europe are clearly flagging the end of line, at least with the old technologies. Wait a minute. If the spot market is truly a market, all producers should be paid the spot price. That includes all the PV producers. But they're not; the PV producers are paid the FIT and other generators are paid something far lower. Who's paying the difference? Are you talking about a "storage" market that's also subsidized by similar mechanisms? Doesn't that just drive up the average price even more? If PV generators were paid the spot price, I doubt you'd have more than a handful (and none profitable). After all these subsidies and transferred costs, I would not be surprised if EPWRs are cheaper even at the first-of-a-kind cost. Non capisco. Can you explain that in detail, including which suppliers are making demands, what they are asking, and the precise meanings of the terms "flagging" and "end of line" in this context? EP, it seems like you haven't read the article, our maybe you didn't understood it. Indeed the concepts of marginal cost and perfect concurrency are awkward, but without grasping them you won't break out of the loop you are in. On nuclear power prices I recommend this note from Jérôme, and also the comments that follow. "it seems like you haven't read the article,"
I read it several times, looking for the costs of storage and/or externalities to be included. You added a few numbers but failed to follow them to a conclusion. For instance, if we assume that your Deka/MK battery has the same cycle performance as the Optima Yellow Top, it will hit its optimum at about 4000 cycles to 22% discharge; for a 3 kWh battery, this is a lifetime throughput of 2640 kWh. At your sale price of €450, that is €0.17/kWh just for storage. Amortization increases that; amortizing €450 over 10 years at 5% costs €57.28 per year, or €0.22/kWh for 246 kWh/yr moved through the battery. Note that sub-optimal cycle depth will degrade the battery faster and cost more per kWh. Do you think you can make money on €0.06/kWh price changes when storage costs €0.22/kWh? I would bet that refrigerators storing cold in phase-change materials would have better economics. Batteries are not good storage media for large amounts of energy, particularly for long-term power supply. Large-scale secondary (rechargeable) energy storage uses things like dams. Primary energy storage is things like coal heaps (medium scale) and uranium stockpiles (collossal scale). A sustainable market-based system needs to pay all generators the spot price (no FIT), with adjustments for transmission cost. Given this, the price paid to RE producers would often hit zero at peak production times. I don't think RE producers would pay €0.06/kWh to generate and get paid 0, at least not for very long. Nuclear looks better and better under these scenarios, particularly on winter nights. "On nuclear power prices I recommend this note from Jérôme, and also the comments that follow." I have read that. I do not find it at all persuasive. I'll try to go into detail later. Okay, I'm back to this. Going through the ET article, I note a number of things that are stated without explanation. The first is the extremely high price of new nuclear energy... in Europe. Why is this? China's overnight cost for an AP-1000 is about $3000/kW(e); this is not high at all. The Olkiluoto 3 plant was pegged at $8.5 billion less than a year ago, or about $5300/kW(e). This is high but not extreme; amortizing at 8% over 20 years and 0.9 capacity factor costs $532/kW/yr and $0.07/kWh, a far cry from the claimed cost of power. Something funny is going on here. The only things that could make power very expensive are punitive regulation creating long construction delays, or very high interest costs. Nothing else is really in the running. The first one is almost purely political, and represents not an engineering difficulty in providing power but a political refusal to allow it. As for the second, central banks are keeping interest rates at historic lows; bonds for nuclear plants would only carry high rates if they were high-risk, which goes back to punitive regulation and other political uncertainties. The dirt-cheap cost of heat from uranium is not something that can be bid up easily by fiat money; you would think that smart governments would realize that making it quick and easy to build standardized nuclear plants in their countries is a weapon against the market power of gas exporters. The second thing I see is a claimed price for off-shore wind power. £180/MWh appears to be the cost for raw energy, delivered when available. The capacity factor of off-shore wind farms is on the order of 40-45%, so this price doesn't come close to what it takes to deliver base-load or dispatchable power. The storage to supply such power from fully renewable resources doesn't exist, and probably can't be built in the next 30 years if ever. The gap will only be filled by fossil fuels, mostly piped NG and LNG; the scheme claimed to be "renewable" and "carbon-free" will be far from either. Third, there are a number of reactor designs which could get rid of much of the uncertainty. B&W's mPower is a factory-built PWR allowing additions in 180 MW(e) increments, and GE-Hitachi's S-PRISM is a modular fast-spectrum design that might also be factory-built in volume and installed on a short schedule. Both would allow the interest cost and market uncertainty to be reduced greatly... if the regulatory and political system allowed it. Everything points to the problems being in government. If I read this (very interesting) article correctly, then I am to assume that adding battery storage for one half day of PV generation is enough to enable an off-grid electricity system. This was somewhat surprising to me, because I did a calculation of how much storage I would need for my own PV system (in the Netherlands) in order to get 99% coverage of my electricity use (in other words, I would accept on average about 80 hours per year of no electricity and empty batteries) To calculate this, I downloaded 10 years of solar insolation data from our Dutch met office. I searched the data for the worst year of sunshine (i.e. with the longest period of <10% sun hours per day). Then, for that year of data, I made an Excel hourly calculation of PV generation and my typical daily and weekly electricity usage pattern. I then added battery storage until 99% of all my electricity demand was met. The result of this exercise was that I would need to add at least 1500 kWh of battery storage. This differs by a factor of 300 from your estimate of 3 kWh or storage needs for a typical household. If possible, could you explain a bit how come my calculation is so very different from yours? Maybe if you explained how much up-time you are assuming for the year (not 100% I presume), and whether you optimized the system for investment cost, or for TCO, or for max% of PV curtailed? At any rate, the conclusion from my calculation (for my household) was that an off-grid PV/battery system would be very expensive, certainly not as cheap as you propose in this article. Sorry, I forgot to mention that I have a 4kWp system that supplies yearly total electricity equal to our yearly usage. I.e. it is an "energy neutral" system, whereby I produce as much as a I use. Of course, I am free to use the electricity even at night, because the utilities in my countries are forced to 'give' me free electricity as long as I 'give' them electricity during sunshine hours. I don't have to pay anything for this service, since the law in my country obliges the utility to provide me with this 'grid storage'service free of charge. Incidentally: do you consider this service of 'grid storage' a subsidy or not? It's not clear from your article. In my understanding of the definition, such a 'grid storage' service is indeed a subsidy, because it costs money for the utility to keep me supplied with electricity. Of course, they pass on that cost to customers, but from my perspective it is a subsidy. In effect, my neighbours (who have no PV system) pay indirectly for my usage of the grid as a 'grid storage' because they pay a little extra on their monthly bill to cover the cost of the 'grid storage' for my household! It's crazy, I know, but that is the law here! Hi Joris, thank you for the comment. This is easy to explain, what I put forth is a scenario for an off-grid PV system, whereas your calculations concern an off-grid household. Both calculations are correct but have very different objectives. Hi Luis, I don't understand yet, what is the difference between an off-grid PV system and an off-grid PV system for a household? In each case, the objective is to meet typical electricity demand without support from the grid, right? From concentrated solar power to floating wind turbines and from printable organic solar cells to biomass gasification. There are many green power technologies that can help us go green . We just need to look around.